Last modified on 3/3/2010 at 9:00:00 PM. Total 5482 views. Taxonomic review of the genus Calocedrus in Vietnam accompanied with modern available data on distribution, ecology and habitat conditions of its two aboriginal species is presented. Detailed illustrated description of recently discovered species C. rupestris endemic to rocky limestone mountains of northern Vietnam is provided. This rare species differs from wide-spread C. macrolepis in obtuse to broadly-obtuse leaf apex; small, subsessile, 4-scaled, broadly-ovate seed cones 4-5(6) x 2.5-3(3.5) mm with very short stalk 0.5-1(1.5) mm long, having 6-8(12) obtuse scales, and fertile seed scales with incurved rounded apex having rough, more or less flat surface without any mucro. Trees of C. rupestris were found as a co-dominant in relictual coniferous forests on rocky hills and ridges composed of highly eroded limestone. Relictual primary, highly endangered woods with this rare tree, as well as their floristic complex represent a unique plant diversity center of global significance. Urgent and effective protection of these areas should be of highest priority for nature conservation activity. Calocedrus Kurz is small genus of the cypress family with trans-oceanic distribution typical for many relict taxa of the Tertiary floras. Before recent floristic investigations in Vietnam it comprised 3 extant species (Li and Keng, 1994; Nguyen Tien Hiep and Vidal, 1996; Fu et al., 1999; Farjon, 2001), namely - Calocedrus formosana (Florin) Florin (distributed in Taiwan), C. macrolepis Kurz (occurring in southern part of China, north eastern Myanmar, Thailand, Laos, southern Vietnam) and - C. decurrens (Torr.) Florin (found in Mexico and southwestern part of the U.S., in California and Oregon). Another species of this relictual genus – Calocedrus rupestris Aver., H. T. Nguyen & L. K. Phan was recently discovered in northern Vietnam (Averyanov et al., 2004). This species is an important addition to our knowledge in Cupressaceae missed out in modern treatment of this family (Farjon, 2005). The only species of Calocedrus reported before for mainland Asia including Vietnam is C. macrolepis. In Vietnam this rare plant is observed in the wild only in the territory of South Annamese floristic province (Dac Lac, Phu Khanh, Ninh Thuan and Lam Dong provinces in southern Vietnam) in mountains composed of acidic silicate rocks at elevations 1000-2000 m. (Nguyen Tien Hiep and Vidal, 1996). Collections of this species from other parts of Vietnam were presumably made from cultivated plants. There are no yet really reliable reports of wild populations of C. macrolepis in northern Vietnam. Morphological analysis of collected materials on C. rupestris reveals distinct and significant differences of this plant and all hitherto known extant species of the genus. Without any doubt, this recently discovered conifer represents well-defined obligate calcium dependent species. It represents the terminal link in one of evolutionary lines of successive reduction of scale number in the seed cones of Cupressaceae. Meanwhile, this outstanding novelty was formally described with insignificant diagnosis in local conference proceedings (Averyanov et al., 2004), which did not get wide distribution. Appropriate description of this plant, as well as key for determination of Calocedrus species in the flora of Vietnam are presented below. Calocedrus Kurz, J. Bot. 11: 196, 1873. 1. Calocedrus macrolepis Kurz, J. Bot. 11: 196, Tab. 133, 1873. Type: CHINA, Yunnan: Daying River, Hotha, Anderson s. n. (holotype, CAL? ; isotype, K). Tree up to 25 m tall, evergreen, monoecious, with broadly rounded crown, trunk to 0.8 m in diam., bark thick, light-brown to gray, fissured, fibrous and exfoliating in longitudinal stripes; timber light yellow, usually fragrant; branchlets flattened, arranged in a plane, ascending, prominently jointed. Leaves decussate, in whorls of 4, imbricate, scale-like, acute to obtuse-acuminate at apex, base decurrent, dimorphic along branchlet, facial pair flattened, oblong to obtrullate, (1.5)2-8 mm long, (1.5)2-4 mm wide, lateral pairs conduplicate, boat shaped, linear-lanceolate, with recurved-incurved acute apex, (1.5)2-8 mm long, (0.3)0.5-1 mm wide, in overlapping facial pairs, commonly with distinct whitish-green stomatal bands. Pollen cones terminal, solitary, oblong to shortly-cylindrical, terete, 5-8 mm long, 2-3 mm broad, light green turning to dull purple-brown, with 10-14 pairs of decussate scales, each with 4 pendulous pollen sacs; microsporophylls (pollen cone scales) about 1 mm long and wide, peltate-orbicular, obtuse-acuminate, with finely denticulate margin; microsporangia (pollen sacs), ovate to sub-spherical, 0.3-0.4 mm long. Seed cone-bearing branchlets (stalks), usually curved, terete or 4-angled, 3-5 mm long, with 16-20 imbricate, decussate, acute scales. Seed cones terminal, solitary, distinctly stalked, pendulous or sub-pendulous, broadly-cylindrical to elongate, 7-12 mm long, 3.5-5 mm wide, dehiscent when mature in first year, with 6 decussate scales; seed cone scales distinctly recurved, somewhat leathery, smooth or slightly rugose, often glaucous, elongate, 5-10 mm long, 2.5-4.5 mm wide; dehiscent when ripe, 1-2-seeded, at apex recurved, apiculate, with short distinct mucro; apical pair straight, laterally flattened, sterile, connate. Seeds ovoid-oblong, acute at apex, slightly flattened, with 2 large sub-apical, unequal wings, 7-12 mm long. Phenology: Pollination occurs in November – January, with seeds maturing in September to October. Etymology: With large scales, from Greek μάχρος – large and λέρίς – squama (meaning large scales of seed cone). Calocedrus macrolepis is widely distributed in southern China (Guangdong, Hainan, Guangxi, Guizhou, southeastern Yunnan), northeastern Myanmar, Thailand, Laos and southern Vietnam (Li and Keng, 1994; Nguyen Tien Hiep, Vidal, 1996; Fu et al., 1999; Farjon, 2001, 2005). However, across its distribution this species is very rare. Natural populations of C. macrolepis are disjunct and relictual, often standing on the verge of extinction in their native habitats. In southern Vietnam this species is recorded from the provinces of Dac Lac (between Buon Tria and Buon Trian Cao and Chu Yang Sin mt), Phu Khanh (Hon Ba mountains), Lam Dong (Da Lat, Camly, Prenh, Trai Mat Municipality and Dan Tala watershed) and Ninh Thuan in Bi Doup mountains (Nguyen Tien Hiep, Vidal, 1996). Few available records of C. macrolepis from northern Vietnam (Tan Vien Mountain, Ba Vi district, Ha Tay province) probably came from cultivated samples (Fig. 1). In Vietnam this tree grows in primary woods with closed canopy, which are evergreen tropical, humid, broad-leaved, mixed or coniferous submontane and montane forests at elevations of 1000-2000 m on soils developed primarily from silicate rocks. Across Vietnam C. macrolepis is represented by single or rarely scattered trees. The trees are widely logged for its valuable timber and therefore the species deserves in the country a conservation status of endangered species (EN) according to RED list Categories and Criteria (EN, A-C, E): Version 3.1 of IUCN (2001). Specimens examined: VIETNAM. Ha Tay Prov. : Ba Vi, 1200 m, Ban 6888 (LE); sine coll. 3670 (HN) all probably cultivated or naturalized. Dac Lac Prov. : between Buon Tria and Buon Trian Cao, 1000-1200 m, Poilane 32620 (P). Khanh Hoa Prov. : Nha Trang, Hon Ba mountain, Krempf 1598 (P). Lam Dong Prov. : near Dalat city, Evrard 1355 (P); Hayata 176; Soviet-Vietnamese expedition LX-VN 1455 (HN, LE); Nguyen Duy Chinh sine n. (HN); Schmid 860, id., Apr. 1954, sine n., id., June 1960, sine n. (P); Vu Van Cuong 1151 (P) all probably cultivated or naturalized; Camly, Evrard 249 (P); Prenn, Evrard 1458, 2202 (P). Border of Lam Dong and Ninh Thuan Prov. : Bi Doup mountains, Poilane s.n. October 1940 (P); Lam Dong Prov., Da Lat city area, Trai Mat Municipality, P.K.Loc, L.Averyanov, T.V.Thao, HLF 5192 13 October 2005 (HN, LE); Lam Dong Prov., vicinities of Da Lat city, near Dan Tala watershed, L.Averyanov, P.K.Loc, N.V.Duy, N.T.Vinh, HLF 5379 24 October 2005 (HN, LE); Lam Dong Prov., Dalat city, L.C.Doan, L.Averyanov, P.K.Loc, HLF 5380 25 October 2005 (HN, LE); Dak Lak Prov., Krong Bong Distr., Hoa Son Municipality, Krong Kmar river, NE slopes of Chu Yang Sin mt, L.Averyanov, T.V.Thao, N.T.Vinh, HLF 5435 28 October 2005 (HN, LE). Fig. 1. Map of distribution of Calocedrus macrolepis (round marks) and C. rupestris (quadrate marks) in Vietnam. Location of presumably cultivated or naturalized specimens are marked with question mark. 2. Calocedrus rupestris Aver., H.T. Nguyen & L.K. Phan, 2004, in Aver., Nguyen Tien Hiep, Pham Van The, Phan Ke Loc, 2004, Proc. Nat. Conf. Life Sci. Thai Nguyen Univ. Sept. 2004: 41*. Footnote*: Arbor 25 m.; folia decussata, dimorpha: folia dorsi-ventralia adpressa, (1)2–6(7) mm longa, (1.5)2-2.5 mm lata; folia lateralia, conduplicata, (1.5)2-6(7) mm longa, (0.3)0.5-0.75(1) mm lata, apice obtuso (non acuto); strobili feminei ovate, (4)5-6(7) mm longa, (2.5)3-4 mm lata; squamae 2 paribus, oppositae, decussatae, squamae inferiore subpeltato, apice incurvo, obtuse-rotundato (non acuminato); pare superioro connato, sterilis. 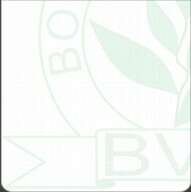 Type: Vietnam, Prov. Bac Kan: Na Ri Distr., Liem Thuy Mun., Na Bo, 21°56'44''N, 106°05'09''E, 650-700 m, 3 June 2004 L. Averyanov, N.T .Hiep, P.V.The, N.T.Vinh HAL 5441 (holotype HN; isotype LE, MO). Paratypes: VIETNAM. Prov. Bac Kan: Na Ri Distr., Liem Thuy Mun., Na Bo, 21°56'44''N, 106°05'09''E, 27 May 2004 L. Averyanov, N. T. Hiep, P. V. The, N. T. Vinh HAL 4919 (HN), 3 June 2004 L. Averyanov, N. T. Hiep, P. V. The, N. T. Vinh HAL 5439 (HN), L. Averyanov, N. T. Hiep, P. V. The, N. T. Vinh HAL 5440 (HN). Tree up to 25 m tall, evergreen, monoecious, with broadly rounded crown, trunk to 1 m in diam., bark 8-12 mm thick, grayish-brown to brown, fissured, fibrous and exfoliating in longitudinal stripes, with numerous large resin ducts, resin abundant, bright yellow-orange, with pine-like fragrance; timber light yellow, odorless or fragrant; branchlets arranged in a plane, spreading and ascending, flattened, prominently jointed. Leaves decussate, in whorls of 4, scale-like, broadly-obtuse to obtuse at apex, base decurrent, dimorphic along branchlet, facial pair flattened (1)2-6(7) mm long, (1.5)2-2.5 mm wide, lateral pairs conduplicate, boat shaped (1.5)2-6(7) mm long, (0.3)0.5-0.75(1) mm wide, in overlapping facial pairs, without glands, uniform green or with very indistinct stomatal whitened bands abaxially. Pollen cones terminal, solitary, cylindrical, terete, (4.5)5-6 mm long, 1.5-2 (2.2) mm broad, with (8)9-11 pairs of scales (the lowest 2-4 pairs sterile), each with 2-6 pendulous pollen sacs; microsporophylls (pollen cone scales) 0.8-1(1.2) mm long, 1-1.2 mm wide, obtuse-rounded to broadly-obtuse, with finely erose margin, obtuse to broadly obtuse at apex, light green turning to light brown; microsporangia (pollen sacs) broadly-ovate to sub-spherical, 0.3-0.4 mm broad. Seed cone-bearing branchlets (stalks) terete or 4-angled, 0.5-1(1.5) mm long, with 6-8(12) imbricate scales, obtuse to broadly obtuse at apex. Seed cones greenish brown, terminal, solitary or paired at apex of lateral branchlets, ovate, (4)5-6(7) mm long, (2.5)3-4 mm wide, dehiscent when mature in first year, with 4 decussate, flat scales (very rarely with 1 additional basal pairs of scale rudiments); seed cone scales flattened, woody or somewhat leathery, broadly ovate, 4-6 mm long, 2.5-4 mm wide; basal 2 scales fertile, dehiscent when ripe, normally 2-seeded (rarely 1), at apex incurved, rounded, sometime with an indistinct, slightly flattened or concave plate with rough surface, rarely with very small insignificant central umbo; apical pair sterile, connate. Seeds ovoid or sub-ovoid, acute at apex, slightly flattened, with 2 large sub-apical, unequal wings, 4-5 mm long. Fig. 2. Calocedrus rupestris Aver., H. T. Nguyen & L. K. Phan. a: Portion of young adult canopy branch. b: Portion of old adult canopy branch. c: Decussate leaves of young adult canopy branch (adaxial side). d: Decussate leaves of young adult canopy branch (abaxial side). e: Young pollen cone on portion of adult canopy young branch. f: Mature pollen cone on portion of adult canopy young branch. g: Microsporophylls with pollen sacs. h: Open pollen sac. i: Portion of young adult canopy branch with seed cone. j & k: Seed cones (front and lateral views) with rudimentary additional pair of sterile scales. l: Seed cone, with fertile cone-scale removed, front view. m: Seed (all drawn from the holotype HAL 5441 by Leonid V. Averyanov). Fig. 3. Habitats and habit of Calocedrus rupestris Aver., H. T. Nguyen & L. K. Phan. A: Pure mono-dominant stand of C. rupestris on steep slopes of rocky limestone ridges in Phong Nha Ke Bang national park (Quang Binh Province); B: Typical canopy shape (same area). C: Base of middle aged tree bole (Bac Kan Province). D: Canopy branches (HAL 6109). 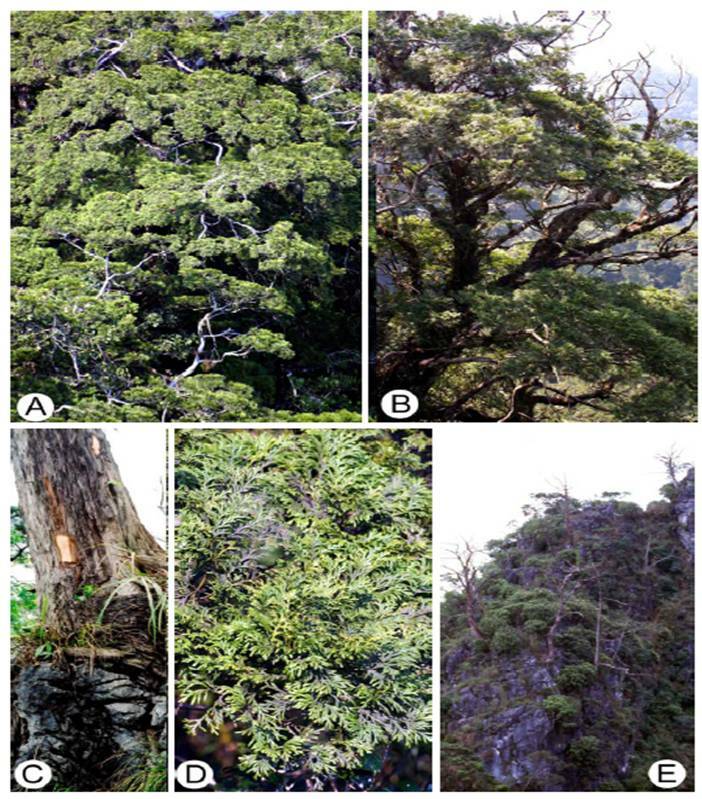 E: Extinction of conifers (Calocedrus rupestris, Pinus kwangtungensis and Pseudotsuga sinensis) on south faced cliffs of low elevated limestone mountains in Bac Kan Province (photographs of Leonid V. Averyanov and Pham Van The). Fig. 4. 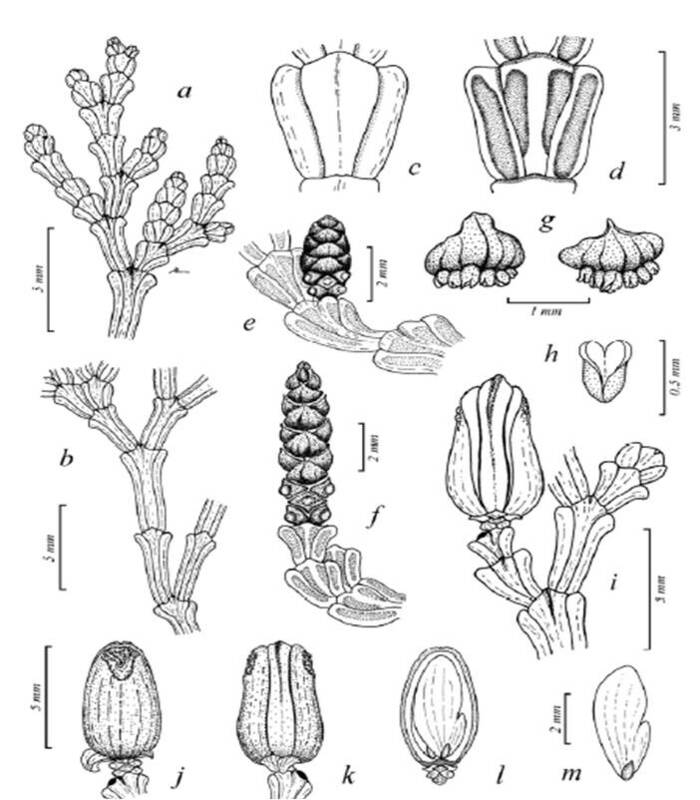 Morphology of Calocedrus rupestris Aver., H. T. Nguyen & L. K. Phan. A & B: Bark of middle (A) and old aged tree (B) at the base of boles (HAL 4919). C: Bole cut to reveal resin ducts and resin drops (HAL 4919). D: Young and ripe pollen cones (HAL 6200). E: Young seed cones (HAL 6200). F: Ripening seed cones (HAL 5441). G: Seed cone formations (HAL 5441) damaged by invasion of insect larvae (photographs Leonid V. Averyanov and Pham Van The). Phenology: Pollination occurs in December – January, with seeds maturing probably in September to October. Etymology: From the Latin word “rupestris” meaning rock-dwelling, growing on rocky slopes or cliffs. Specimens examined: VIETNAM. Prov. Cao Bang, Bao Lac Distr., Yen Lac Municipality, vicinities of Yen Lac village, 22°44' N, 105°50' E, 1450-1500 m, 16 April 1999, P.K.Loc, P.H.Hoang, L.Averyanov CBL 1462 (HN), sterile; Bao Lac Distr., Dinh Phung Municipality, Man Lung ridge, 22°47' N, 105°49' E, 1550-1600 m, 18 April 1999, P.K.Loc, P.H.Hoang, L.Averyanov CBL 1515 (HN), sterile.- Prov. Ha Giang, Yen Minh Distr., Lao Va Chai Municipality, vicinities of Ngan Chai village, 6 km to W of Yen Minh town, 23°07' N, 105°08' E, cultivated treelet introduced from wild at 1600-1700 m, 1 May 1999, P.K.Loc, P.H.Hoang, L.Averyanov CBL 1977 (HN), sterile. ; Quan Ba Distr., Bat Dai Son Municipaliry, Bat Dai Son Nature Reserve, around point 22°59'50'' N, 105°05'46'' E, about 1600 m, 10 May 2002, P.K.Loc, L.Averyanov, N.T.Vinh HAL (HN), sterile; Quan Ba District, Can Ty Municipality, at Sin Suoi Ho village and river, 23°06'57" N, 105°01'48" E, 514-900 m, 1 April 2000, D.K.Harder, N.T.Hiep, L.Averyanov DKH 4854 (HN), sterile; Quan Ba Distr., Can Ty Municipality, in the vicinity of Lung Vai village at left side of Mien River, 23°05'09'' N, 105°03'23'' E, 1440 m, 8 May 2002, P.K.Loc, L.Averyanov, N.T.Vinh HAL 1457 (HN), sterile; Quan Ba Distr., Can Ty Municipality, Ha Tung Sung Valley, Bat Dai Son Natural Reserve around point 23°05'46’’ N, 105°01'05’’E, 1230 m, 18 January 2003, T.V.Thao, N.S.Khang VT 021 (HN), sterile.- Quan Ba Distr., Thanh Van Municipality, cultivated tree taken from the wild in the vicinity of Lung Cung village at right side of Mien River, around point 23°07'12'' N, 105°00'52'' E, 980 m, 8 May 2002, P.K.Loc, L.Averyanov, N.T.Vinh HAL 1471 (HN), sterile; Quan Ba Distr., Thanh Van Municipality, in the vicinity of Lung Cung village, around 1 km to the E from point 23°05'32'' N, 105°00'10'' E, 1100-1200 m, 9 May 2002, P.K.Loc, L.Averyanov, N.T.Vinh HAL 1493 (HN), sterile; Quan Ba Distr., Thai An Municipality, in the vicinity of Lo Thang village, 22°59'50'' N, 105°05'46'' E, 1600 m, 10 May 2002, P.K.Loc, L.Averyanov, N.T.Vinh HAL 1513 (HN), sterile; Quan Ba District, Thai An Municipality, December 1999, N.Tap 2B (HN), sterile.- Prov. Son La, Yen Chau Distr., Muong Lum municipality, Lum village, 21°00'47'' N, 104°29'30'' E, 1200-1350 m, 2 March 2001, D.Harder, P.K.Loc, N.T.Hiep, L.Averyanov DKH 7066 (HN), young female cones; Moc Chau Distr., Van Ho Municipality, Hua Tat village, 20°46'18'' N, 104°47'45'' E, 1200-1350 m, 6 October 2000, D.Harder et al. DKH 5763 (HN), sterile.- Prov. Hoa Binh, Da Bac Distr., to the SW of Doan Ket village, 20°54'01'' N, 105°04'19'' E, 900-1000 m, 29 March 2001, N.T.Hiep, L.Averyanov, N.T.Vinh, D.T.Doan HAL 367 (HN), sterile. ; Mai Chau Distr., Hang Kia Municipality, near Thung Ang village, mountain Tao Xinh, 20°43'43'' N, 104°51'21'' E, 1000-1100 m, 6 April 2001, N.T.Hiep, L.Averyanov, N.T.Vinh, D.T.Doan HAL 629 (HN), sterile.- Prov. Nghe An, Con Cuong Distr., Binh Chuan Municipality, Phu Pha Cau mt., 19°18'13'' N, 104°53'50'' E, 1100-1250 m, 26 February 2004, V.M.Son, N.T.Vinh HLF 3136 (HN), sterile. - Prov. Quang Binh, Bo Trach Distr., Tan Trach Municipality, vicinities of A Rem village, 17º23'32'' N, 106º12'46'' E, 650-750 m, 24 January 2005 L.Averyanov, P.K.Loc, P.V.The, A.Averyanova, N.T.Vinh, N.Q.Vinh, N.T.Binh HAL 6109 (HN, d-EXSICCATE OF VIETNAMESE FLORA 0001/HAL6109), male and young female cones, 25 January 2005, HAL 6164 (HN), male and young female cones, 26 January 2005, HAL 6200 (HN), male and young female cones. Most significant morphological differences between Calocedrus macrolepis and C. rupestris are summarized in Table 1. Calocedrus rupestris along with other endemic and sub-endemic conifers like Callitropsis vietnamensis (Farjon & T. H. Nguyen) D. P. Little, Keteleeria davidiana (Bertrand) Beissn., Pinus kwangtungensis Chun ex Tsiang, Pseudotsuga sinensis Dode, Tsuga chinensis (Franch.) Diels, as well as other gymnosperm trees such as Amentotaxus argotaenia Pilger, A. hatuyenensis N. T. Hiep, A. yunnanensis Li, Cephalotaxus mannii Hook.f., Dacrycarpus imbricatus (Blume) de Laub., Dacrydium elatum Wall., Nageia fleuryi (Hickel) de Laub., Podocarpus neriifolius D. Don, P. pilgeri Foxworthy and Taxus chinensis Roxb. represents formative element of primary mixed and coniferous forests in rocky limestone areas of northern Vietnam. These woods form here floristic nucleus of highly endemic limestone floras and support specific very sensitive ecosystems of outstanding high level of biodiversity. A great number of strict endemics of high taxonomic rank are associated with woods of this kind. Among them are recently discovered endemic and sub-endemic genera such as Caobangia A. R. Smith &t X. C. Zhang (Polypodiaceae), Grushvitskya Skvorts. et Aver. (Araliaceae), Vietorchis Aver. et Averyanova and Zeuxinella Aver. (Orchidaceae), Callitropsis (Cupressaceae), and some others (Skvortsova & Averyanov, 1994; Farjon et al., 2002; Averyanov et al., 2002; A. R. Smith and X. C. Zhang, 2002; Averyanov and Averyanova, 2003). Table 1. 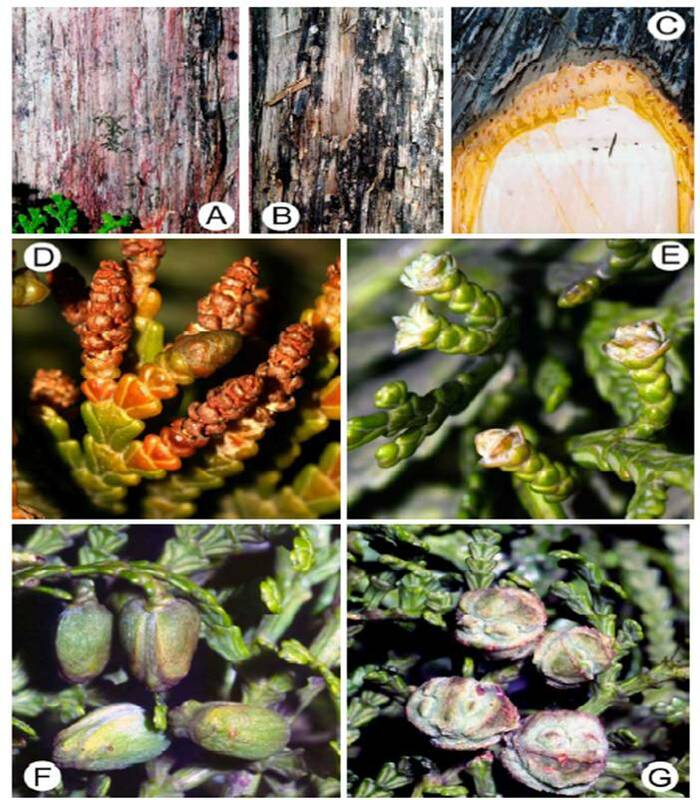 Morphological differences between Calocedrus macrolepis and C. rupestris. In the past Calocedrus rupestris was undoubtedly widely distributed in northern Vietnam. This tree was one of the most important species-edificator of woody communities and indicator of intact pristine primary climax aboriginal zonal relictual woods typical for ancient highly eroded remnant rocky limestone ridges in northern part of eastern Indochina. During modern explorations it was commonly found as a more or less usual co-dominant of the first forest stratum in last remains of primary mixed and coniferous forests associated regularly with Dacrycarpus imbricatus, Dacrydium elatum, Keteleeria davidiana, Pinus kwangtungensis and Pseudotsuga sinensis. Presently this tree form majestic mono-dominant pure stand in a few places of the country (Fig. 3A). Forests with C. rupestris commonly cover the rocky tops of ridges and hills composed with highly eroded solid crystalline white and gray marble-like limestone. The coniferous canopy stratum in these forests commonly does not exceed 15-20 m tall on more or less open isolated rocky tops of limestone remnant mountain formations. However, on steep slopes near the tops, some conifers (particularly Keteleeria davidiana) often reach 30 m tall with trunks to 1.5 m in diameter. The largest observed samples of C. rupestris were about 25 m tall and about 1.2 m in diameter. Preliminary observation of timber rings indicates that these trees are probably more than 600-800 years old. The maturity of micro sporangia and pollination of this species come in December – January, while seed dispersing falls probably on September – October. In our days distribution of Calocedrus rupestris in northern Vietnam due to deforestation is very limited and comprises miserable isolated disjunctive rocky limestone hilly and mountain systems with predominant elevations 600-1000 (1600) m. Available data on distribution of this species are summarized on the map of distribution (Fig. 1). This cypress tree probably may be also found in many other isolated rocky limestone mountains of northern Vietnam, which still keep primary woody vegetation. However, in most observed localities this tree definitely becomes rare due to many factors and exactly moves to its coming extinction. Some discovered localities of C. rupestris were found very near to Chinese and Laotian borders (Fig. 1). This fact indicates that species may be also found in limestone regions of both mentioned countries allied to the territory of Vietnam. Largest intact stands of Calocedrus rupestris were recently found and studied in south-eastern part of Bac Kan Province (bordering with Thai Nguyen and Lang Son provinces in the center of northern Vietnam) and in Quang Binh Province (in limestone area of Phong Nha – Ke Bang national park). In these studied areas C. rupestris represents an integral element of primary coniferous forests with Keteleeria davidiana, Pinus kwangtungensis and Pseudotsuga sinensis (Bac Kan) and with Dacrycarpus imbricatus and Dacrydium elatum (in Quang Binh Province). Fragments of these forests cover isolated rocky tops and edges of ridges of highly eroded remnant limestone formations, which appear as a numerous hills, small mesae-like mountains or rocky ridges with very steep slopes and numerous vertical cliffs. Mountains in studied areas are composed of solid crystalline white to gray marble like limestone, which represents relictual geologic formation derived from marine deposits presumably of late Paleozoic age (Dovzikov et al., 1965a, b). Deep erosion of ancient highly metamorphosed marble-like limestone formed spectacular landscape in this area, which still keeps primary vegetation typical for rocky limestone areas of north-eastern Indochina. Recent climatologic studies define climate in the area of Calocedrus rupestris distribution as monsoon tropical climate with cold winter and summer to summer-autumn rains (Nguyen Khanh Van et al., 2000). Summers here are wet, with rainfall peaks coming to July - October. Annual rainfall commonly varies from 1200 to 3000 with mean annual rainfall for the region averaged at about 2200 mm. Temperature regimes have a strong seasonality and depend of elevation. Winter conditions with cool temperatures extend usually from November to April with normal lows in lowlands of 14-16°C. The mountain regions experience cooler temperatures and higher levels of mean annual rainfall with increasing elevation. At elevations above 900-1000 m night hoarfrost is sometimes observed in open places during winter months. Persistent cool drizzling rains are very typical from early February until the end of March. Summers are hot and humid, with maximum temperatures reaching to 35°. Common mean annual temperatures are about 23.5 C. Detailed description of climate conditions of the mentioned area was presented earlier (Averyanov et al., 2003a, b). Canopy forest stratum in the area of Calocedrus rupestris distribution reaches on tops of limestone mountains 15-20 m tall, but is elevated up to 25-30 m on slopes protected from winds. Some broad-leaved trees, like Platycarya strobilacea and several tropical oaks (Quercus spp.) occur sometimes in this stratum besides mentioned conifers. On mountain slopes broad-leaved trees become more common in the first forest stratum and often include such species as Anogeissus acuminata, Bischofia javanica, Dracontomelon duperreanum, Pometia pinnata, Radermachera sinica, Streblus macrophyllus, as well as species of Aglaia, Lagerstroemia, Paulownia, Sterculia and Toona. Second forest stratum includes many species of trees commonly 6-15 m tall. Among them most common are Acer tonkinense, Boniodendron parviflorum, Carpinus sp., Celtis sp., Cinnamomum sp., Ficus spp., Garcinia sp., Knema sp., Lysidice rhodostegia, Machilus sp., Myrsine seguini, Nephelium sp., Ormosia sp., Pistacia weinmannifolia, Radermachera boniana, Reevesia sp., Schefflera pes-avis, Sinosideroxylon racemosum and S. wightianum. Some gymnosperm trees, such as - Amentotaxus yunnanensis, Cephalotaxus mannii, Nageia fleuryi and Podocarpus neriifolius are also regular component in this stratum. Next stratum of the forest includes small trees and shrubs commonly (1.5)2-6 m tall. They are creating more or less dense cover composed with great number of species. Main co-dominants here are such species as Alstonia guangsiensis, Blastus cochinchinensis, Campylotropis henryi, Decaspermum parviflorum, Illicium cambodianum, Licuala sp., Ligustrum sp., Mahonia nepalensis, Memecylon edule, Myrsine kwangsiensis, Phyllanthus sp., Pistacia cucphuongensis, Psychotria sp., Rhapis divaricata, R. subtilis, Rhodamnia trinervia, Schefflera sp. and Tirpitzia sinensis. On steep more or less open slopes and cliffs may be observed short palm-like cycads - Cycas dolichophylla and C. chevalieri. Herbaceous species composition in habitats of Calocedrus rupestris is extraordinarily rich and includes a great number of terrestrial and lithophytic species among which most common are species of Aglaonema, Alpinia, Amorphophallus, Ardisia, Arisaema, Carex, Disporum, Elatostema, Ophiopogon, Ophiorrhiza, Peliosanthes, Polygonatum and Tupistra. On the shady forest floor are occasionally observed rare achlorophyllous mycotrophyc and parasitic species of Balanophora, Burmannia unguiculata, Didymoplexis pallens, Epipogium roseum and Sciaphila stellata. Vertical cliffs represent typical habitat of numerous obligate lithophytes, such as Begonia aptera, B. cavaleriei, Calcareoboea coccinea, numerous species of Aeschynanthus and Boea, as well as many ferns (Adiantum caudatum, A. gravesii, Amphineuron tonkinense, Antrophyum sp., Arthropteris repens, Asplenium antrophyoides, A. cardiophyllum, A. griffithianum, Colysis bonii, Colysis elliptica, Colysis pothifolia, Ctenitopsis austrosinensis, Cyclopeltis crenata, Cyrtomium fortunei, Lemmaphyllum microphyllum, Neocheiropteris ensata, Polystichum spp., Pyrrosia porosa, Tectaria polymorpha, T. stenomioides, T. subpedata). The orchids reach extraordinary high diversity in coniferous forests with Calocedrus rupestris. Most of them are rare obligate calcium dependent species growing as lithophytes and epiphytes. More than hundred such species may be commonly observed in habitats of C. rupestris. Most typical orchid species growing here are Acampe rigida, Aerides rosea, Bulbophyllum macraei, Ceratostylis himalaica, Cheirostylis yunnanensis, Cleisostoma rostratum, Coelogyne fimbriata, Cymbidium ensifolium, C. lancifolium, C. sinense, Dendrobium fimbriatum, D. hercoglossum, D. loddigesii, D. nobile, D. spatella, D. thyrsiflorum, Eria pannea, E. pusilla, E. siamensis, Liparis distans, L. latilabris, L. mannii, Oberonia ensiformis, O. kwangsiensis, Paphiopedilum concolor, Pelatantheria insectifera and Renanthera coccinea. Primary coniferous forests with C. rupestris also support habitats of numerous very rare, endangered endemics of South Chinese and North Indochinese floristic provinces (Averyanov et al., 2003a, b). Among them are such orchids as Anoectochilus calcareus, Biermannia calcarata, Bulbophyllum ambrosia, B. longibrachiatum, Cleisostoma melanorachis, C. simondii, Eria thao, Habenaria ciliolaris, Liparis averyanoviana, L. petraea, L. pumila, Luisia appressifolia, Paphiopedilum emersonii, P. hangianum, P. helenae, P. esquirolei, P. malipoense, Pholidota roseans, P. yunnanensis, Renanthera citrina, Rhomboda petelotii and Vanda fuscoviridis. Without any doubts, all discovered stands of C. rupestris represent highly endemic, unique plant diversity centers of global significance. Urgent and effective protection of nature in these areas should be regarded as a goal of highest priority in the World nature protection strategy. Logging of Calocedrus rupestris, as well as other cypress trees (like Fokienia hodginsii, Calocedrus macrolepis, or Callitropsis vietnamensis) with fragrant valuable timber highly demanded on domestic and international market is serious factor of their fast extinction in most areas of their primary distribution in Vietnam. Very few seedlings and saplings of Calocedrus rupestris were observed during field exploration in most studied localities. Definitely, general climate desertification connected with wide deforestation in northern Vietnam is the important limiting factor which damaged natural age-spectrum of population C. rupestris in their natural habitats. Certainly, in prehistoric ages coniferous limestone forests found acceptable conditions on relatively low elevations and spread widely in northern Vietnam. In our days these plant communities and populations of concrete coniferous species on low elevations rapidly degrade due to global decrease of humidity (even being not directly damaged by human activity). The climate warming connected with very wide deforestation shifts ecological optimum of most conifers to more high elevations. This process leads to slow invincible extinction of conifers in mountain systems where elevations do not exceed 700-800 m (Fig. 3E). Ecological optimum of most native coniferous species is now out of this mountain belt and their populations on low elevations are highly endangered and extremely sensitive to any damage. It is particularly true for C. rupestris. Obviously, this unique relict of the world flora desires status of endangered species and should be reasonably included in Red Data Book of Vietnam as endangered species (EN) according to RED list Categories and Criteria EN, A2cd, C1, E (Version 3.1 of IUCN, 2001, Nguyen Tien Hiep et al., 2004). Certainly, all populations of this species need urgent effective protection that may prevent future extinction of this significant endemic species in nature. In our days largest stands of intact primary woods with C. rupestris in Vietnam were observed in rocky limestone areas of Phong Nha – Ke Bang national park (Fig. 3A). Relatively large pristine forest lands on this territory probably still support appropriate humidity, microclimate, soil, edaphic, watering regime and other natural conditions peculiar to indigenous intact plant zonal limestone communities of northern part of eastern Indochina. This is alone observed locality of C. rupestris with normal age spectrum of populations, which exhibit normal succession of natural species regeneration from seedlings and saplings to ripe trees up to 25 m tall and 1.2 m of bole diameter presumably 600-800 years old (Fig. 3B). Definitely C. rupestris woods in this area represent unique intact model of primary zonal limestone vegetation typical for pristine indigenous nature of Indochinese peninsular. It is necessary underline, that coniferous forests on rocky limestone are most endangered type of vegetation in the world. Such forests were extinct completely in most areas of their natural distribution and their natural regeneration always very problematic. In this connection, absolute integrated protection of coniferous woods with C. rupestris on the territory of Phong Nha – Ke Bang national park are extraordinary important point of nature protection activity of high national, as well as global significance. It was noticeably to observe that sometimes many seed cones in populations of Calocedrus rupestris were damaged by very small unidentifiable insect larvae. All damaged cones became enlarged and were uniformly developed into spherical seedless formations with hemi-woody connate sub peltate scales, which superficially resemble cones of Fokienia hodginsii or some species of Chamaecyparis (Fig. 4G). Formation of such unusual peculiar terats may give indirect evidence on certain relationship of mentioned genera. On the other hand, the occasional insect invasion and damage of female cones may be limiting factor for successful seed propagation of this species in natural localities. Meanwhile, its introduction into cultivation may be an additional important effective action for protection of this relictual tree ex situ. We cordially thank authorities of the Institute of Ecology and Biological Resources of the Academy of Science and Technology of Vietnam for comprehensive help in organizations of all our investigations. 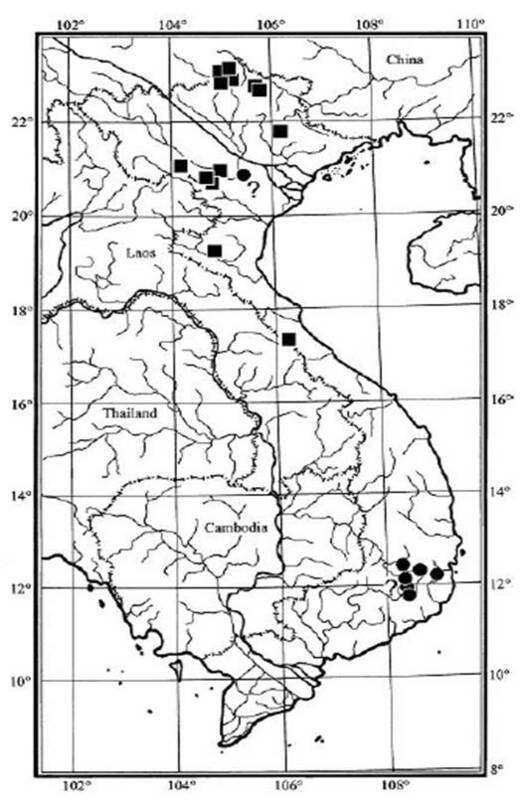 Field studies in Vietnam, the results of which are presented in this paper, were funded by grants from the U.S.A. National Geographic Society (grant 7577-04 "Exploration of rocky limestone flora and vegetation in Bac Kan province, northern Vietnam"), American Orchid Society ("Discovery of endemic orchid flora in remote limestone areas of Northern Vietnam") and from jointed program of Fauna & Flora International and Counterpart International (Preliminary survey of orchids (Orchidaceae) in Phong Nha – Ke Bang national park). We cordially thank Dr. Jacinto C. Regalado from Missouri Botanical Garden, U.S.A for his kindest help in improving the English text of this paper. Averyanov, L. V. and A. L. Averyanova. 2003. Updated checklist of the orchids of Vietnam. Vietnam National University Publishing House, Hanoi, Vietnam. 102pp. (Bilingual, in English and in Vietnamese). Averyanov, L. V, N. T. Hiep, D. K. Harder and P. K. Loc. 2002. The history of discovery and natural habitats of Xanthocyparis vietnamensis (Cupressaceae). Turczaninowia. 5, 4: 31-39. Averyanov, L. V., P. K. Loc, N. T. Hiep and D. K. Harder. 2003a. Phytogeographic review of Vietnam and adjacent areas of Eastern Indochina. Komarovia. 3: 1-83. Averyanov, L., P. Cribb, Phan Ke Loc and Nguyen Tien Hiep. 2003b. Slipper Orchids of Vietnam. With an Introduction to the Flora of Vietnam. Royal Botanic Gardens, Kew. Compass Press Limited, UK. 308pp. Averyanov, L. V., Nguyen Tien Hiep, Pham Van The and Phan Ke Loc. 2004. Calocedrus rupestris sp. nov. (Cupressaceae), new relict coniferous species from limestone areas of northern Vietnam. Basic Research in Life Sciences with emphasis on upland agriculture and forestry. Proceedings of the National Conference on Life Sciences. Thai Nguyen University, September 23, 2004. Science and Technics Publishing House, Hanoi, Vietnam. 2004. pp. 40-44. (in Vietnamese). Dovzikov A. E. et al. 1965a. In: Dovzikov A. E. (ed. ), Geological map of Vietnam 1:500000. Main Geological Department of DRV, Hanoi, Vietnam. Dovzikov A. E. et al. 1965b. In: Dovzikov A. E. (ed. ), Geology of the North Vietnam. Description for geological map of the North Vietnam 1:500000. Main Geological Department of DRV, Hanoi, Vietnam. p. 668. (in Russian). Farjon, A. World checklist and bibliography of conifers. 2 ed. 2001. Royal Botanic Gardens, Kew. The Bath Press, UK. p. 309. Farjon, A. 2005. A monograph of Cupressaceae and Sciadopitys. Royal Botanic Gardens, Kew, UK. p. 648. Farjon, A., N. T. Hiep, D. K. Harder, P. K. Loc and L. V. Averyanov. 2002. A new genus and species in Cupressaceae (Coniferales) from Northern Vietnam. Xanthocyparis vietnamensis. Novon. 12: 179-189. Fu, L.-G., Y.-F. Yu and A. Farjon. 1999. Cupressaceae. In Flora of China. 4. Cycadaceae through Fagaceae: 62-77. Missouri Botanical Garden Press, St. Louis, USA. IUCN. 2001. IUCN Red List Categories: Version 3.1. Prepared by the IUCN Species Survival Commission. IUCN. Gland, Switzerland, and Cambridge, UK. Li, H.-L. and H. Keng. 1994. Pteridophyta – Gymnospermae: Cupressaceae. In: Huang, T.-C. et al. (eds. ), Flora of Taiwan, 2nd ed. 1: 586-595. Editorial Committee, Dept. Bot., NTU, Taipei, Taiwan. Nguyen Khanh Van, Nguyen Thi Hien, Phan Ke Loc and Nguyen Tien Hiep. 2000. Bioclimatic diagrams of Vietnam. Hanoi, Vietnam Nat. Univ. p. 126. Nguyen Tien Hiep, Phan Ke Loc, Nguyen Duc To Luu, P. I. Thomas, A. Farjon, L. Averyanov and J. Regalado. 2004. Vietnam Conifers: Conservation Status Review 2004. Fauna & Flora International, Vietnam Programme, Hanoi, Vietnam. p. 128. Nguyen Tien Hiep and J. E. Vidal. 1996. Gymnospermae. Flore du Cambodge, du Laos et du Vietnam. 28. Mus. Natl. D'Hist. Nat., Paris. 166pp. Skvortsova, N. T. and L. V. Averyanov. 1994. New genus and species - Grushvitzkya stellata (Araliaceae) from the North Vietnam. Bot. Zurn. (St.-Petersburg). 79: 108-112 (in Russian). Smith, A. R. and X. C. Zhang. 2002. Caobangia, a new genus and species of Polypodiaceae from Vietnam. Novon. 12: 546-550.